Though Jason Reitman's "The Front Runner" feels like it could be timely in the current political climate, it doesn't add much that's new to the conversation. And it gives short shrift to its most interesting story: that of a political marriage. Rating: 2.5 stars out of 4. 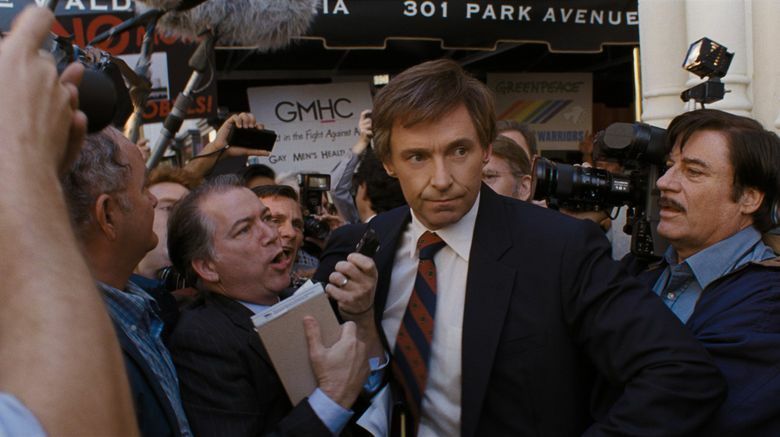 Jason Reitman’s “The Front Runner” is so crowded with characters and overlapping conversations and crammed-full rooms that it’s easy to miss the quiet at its center: the enigma that is Gary Hart. As played by Hugh Jackman, he’s a classic politician on the surface — polished, smiling, ever-ready with position statements. In other words, he was a dream candidate and the front-runner for the Democratic presidential nomination in the 1988 election, until the three weeks in 1987 when it all came tumbling down. After a brief, busy prologue, “The Front Runner” unfolds over those three weeks, in a series of bars, newsrooms, campaign offices and cramped planes. If you don’t have a super-clear memory of what happened then (I didn’t), you might find the story told here somewhat less than clear. Essentially Hart, married for many years to his wife Lee (Vera Farmiga), found the momentum of his campaign halted when newspapers published allegations of an extramarital affair with a woman named Donna Rice (Sara Paxton). Both he and Rice denied any impropriety, but the scandal ended his presidential hopes. Reitman, in choosing to tell the story in this messy, overcrowded fashion, finds something of the chaos of a real-life campaign. But he also loses something along the way — I kept mixing up the various journalists and campaign workers — and the movie ultimately feels exhausting, raising issues it doesn’t have the energy to address (about morality, the role of journalists, the public’s right to know) and presenting a wide-eyed Rice as a lamb led to slaughter. Though “The Front Runner” feels like it could be timely in the current political climate, it doesn’t add much that’s new to the conversation. And it gives short shrift to its most interesting story: that of a political marriage. Farmiga does wonders with her few scenes — her cool “I see” after being informed of the Rice allegations is a tiny master class — but you leave the film pretty much as you approached it, seeing both of the Harts as ciphers. “People want to get to know the Harts as regular people,” says a campaign worker, early in the film. They’re not, but this intriguing yet frustrating film never quite tells us why. ★★½ “The Front Runner,” with Hugh Jackman, Vera Farmiga, J.K. Simons, Sara Paxton, Alfred Molina. Directed by Jason Reitman, from a screenplay by Reitman and Matt Bai, based on the book “All the Truth Is Out” by Bai. 113 minutes. Rated R for language including some sexual references. Opens Nov. 16 at Lincoln Square Cinemas.